Many people who read this blog and follow the Free Richard Wershe, Jr. Facebook page are frustrated and eager to help, to ‘do something.’ It may not be glamorous, it may not be exciting, but one thing anyone and everyone can do is pressure their local State representative and Senator to get serious about Corrections reform. The prison system is THE biggest single drain on the budget for the State of Michigan. The system has no oversight, it has no accountability, it has no system for determining in any accurate way who should be released and who should remain behind bars. If you’re interested in stories about how your tax dollars are squandered, read on. Let’s suppose for a moment that someone in Lansing demanded 20% of every tax dollar you send to the State of Michigan at tax time. Let’s suppose they told you this money is being spent to keep you “safe” from crime and criminals. Let’s also suppose these same people are accountable to no one. Oh, sure. They spend the money alright. Thousands of people are behind bars. But you have no way of knowing if it is being spent wisely or cost-effectively. You don’t know if all that money is keeping you safer. It’s probably not much comfort to tell you they don’t know the answer, either. Twenty percent. Two zero percent. 20%. That’s a big chunk of your tax dollars to pour down a black hole year in and year out with no evidence either way on whether that money is achieving its intended goal of rehabilitating wrongdoers and making the state safer from crime. That’s what’s happening to a disturbing degree with the direct pipeline from the Michigan Treasury to the Michigan Department of Corrections. At the end of last year, the latest figures show Michigan had 43,359 prison inmates. That’s down slightly from the previous year, which had an increase in prison admissions. We will stipulate up front that some people deserve to be in prison. Those prone to violent crime are not good candidates for parole, particularly repeat offenders. This is not the issue. Look at the following 2013 chart from the Michigan Department of Corrections. 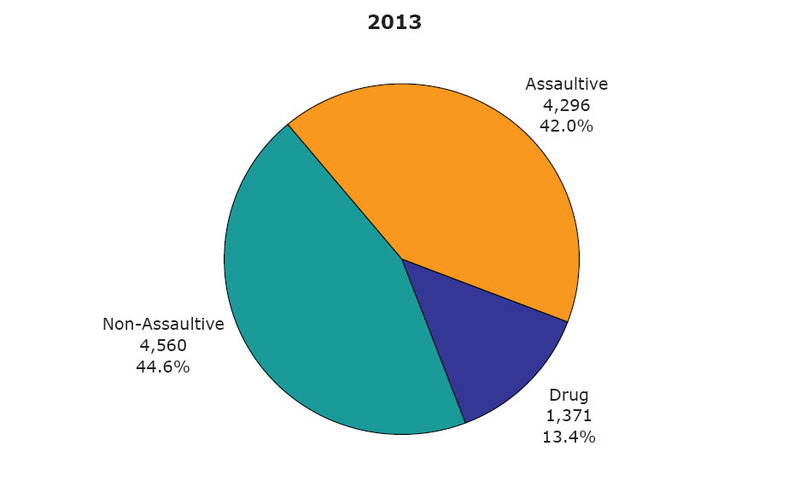 Forty-two (42%) percent of the inmates were in for assaultive crimes. No argument there. But look at the rest of the pie chart. On the left we see 44.6% of the prison inmates are serving time for non-assaultive crimes. Another 13.4% are serving time for non-violent drug crimes. Add it up and you’ll see 58% of the Michigan prison population is behind bars for non-violent offenses. The latest figures from state budget officials show Michigan is spending $38,171 per-inmate per-year to keep over 43 thousand people behind bars, even though over half of them are doing time for non-violent crimes. That’s $104.58 per inmate every single day regardless of what they did, regardless of whether they—and you—might be better served if they were in some non-prison program truly intended to steer them toward a life as a law-abiding citizen. Does this strike you as a good use of your tax dollars in an era when the public infrastructure—roads, bridges, sewers—are disintegrating? As an aside, the water system crisis in Flint, Michigan is just the tip of the iceberg. The American Society of Civil Engineers (ASCE) gives the entire nation's critical infrastructure a D+. They say $3.6 Trillion is needed to get us out of crisis mode by 2020. Back to the prisons issue. Consider inmate health care. Case law is well established, from the U.S. Supreme Court on down, that if the state deprives someone of their liberty for any reason, including incarceration, the state has an obligation to provide that person with medical and dental care. It’s not an option. You are on the hook to provide them with decent quality medical and health benefits no matter what because they can’t choose for themselves. They don’t have a choice and therefore you don’t, either. What’s that you say? Inmate so-and-so didn’t take care of his health while he was on the outside? It doesn’t matter. The People of the State of Michigan have decided to deprive Inmate so-and-so of his liberty, his freedom, his ability to care for himself. That means the people are on the hook for “free” medical and dental care. In 2014 that amounted to $6,560.00 per inmate in Michigan, on average. It seems reasonable to wonder why the Obamacare haters of Michigan are not up in arms over free medical and dental for about 25,000 prison inmates who were not involved in violent crime. They wouldn’t have free medical and dental if they were on parole. This brings us to the horribly broken parole system in Michigan. Most prison sentences have a minimum and maximum, say 15 to 30 years as an example. This means the inmate is eligible for parole consideration after serving 15 years. As inmates approach their parole consideration date the Department of Corrections staff prepare documents which presumably help the Parole Board determine if an inmate is a good risk for parole. Lots of cases come up for review so the Parole Board has a full work load. Each member takes a batch of cases and reviews what the staff has prepared and interviews the inmate. These interviews are often quick due to the volume of cases under consideration. That Parole Board member then makes a recommendation unless there is some puzzling element. In that case, a second board member might review it. If there’s no agreement, a third might get involved and if that doesn’t resolve the issue, it might go to the full board for consideration. There’s a catch—and it’s a big one. What if the information in the inmate’s file is wrong? What if there is no evidence to support the allegations made against him or her? What if the inmate is guilty but is not, was not, as bad as some police report in the file indicates? What if there is no factual evidence to support claims he or she is a menace to society? Answer: Too bad. There is no procedure, no mechanism—none—to verify the facts or falsehoods about any given inmate. “It’s a flawed system,” says Robert Aguirre, a former member of the Michigan Parole Board. 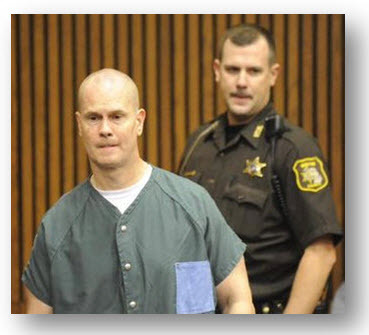 Over the past year Informant America has pointed out in great detail the misleading and in some cases outright false “evidence” presented to the Michigan Parole Board in Rick Wershe, Jr.’s one and only parole hearing in 2003. That’s the one where the Parole Board was told he is a menace to society. He’s been “flopped” without any Parole Board interest in his case five times since then. It would be like someone discovering a dangerous flaw in a highway bridge and the Michigan Department of Transportation (MDOT) saying, sorry, we don’t have a procedure for accepting information about the condition of the bridge after it has been built. What’s done is done. In Rick Wershe’s case this means picking the pockets of the Michigan taxpayer every year to keep him incarcerated for 28 years for a non-violent drug arrest when he was 17 years old. Previous Informant America blog posts have demonstrated through official investigative documents that Rick Wershe, Jr. is not and was not a menace to society. He was only a menace to corrupt Detroit cops and the relatives of Detroit’s late mayor, Coleman Young. Wershe committed the unpardonable sin of helping the FBI prosecute drug corruption in the police department and in Coleman Young’s family. Detroit’s Black Political Machine has had it in for him ever since. Why Michigan’s taxpayers are footing the bill for a vendetta by Detroit’s Black Political Machine is anybody’s guess.